Karakalpakstan was once a prosperous region thanks to the fishing industry. It even received the Lenine medal twice, for supplying fish tins to soldiers. 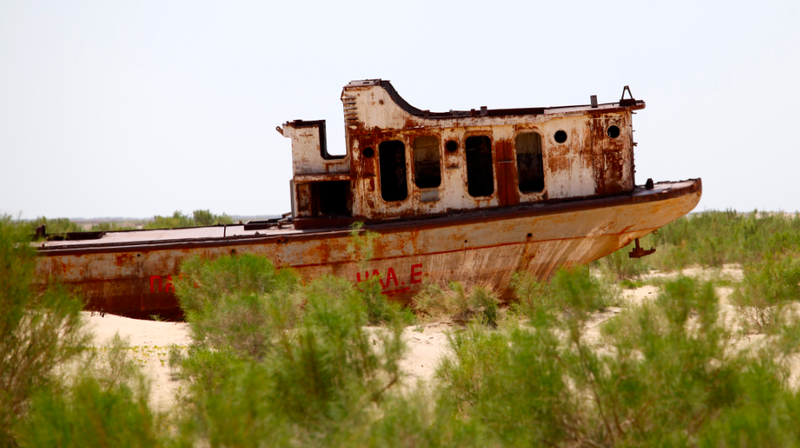 The shrinking of the Aral Sea has obviously resulted in unemployment and economic hardship. Moynaq, 210km north of Nukus, encapsulates more visibly than anywhere the absurd tragedy of the Aral Sea. Once one of the sea’s two major fishing ports, it now stands more than 150km from the water. 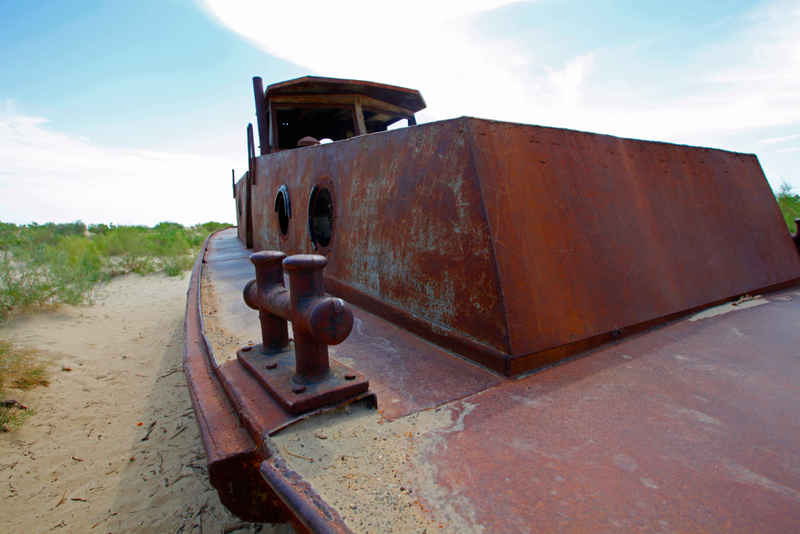 What remains of Moynaq’s fishing fleet lies rusting on the sand, beside depressions marking the town’s last futile efforts in the early 1980s to keep channels open to the shore. 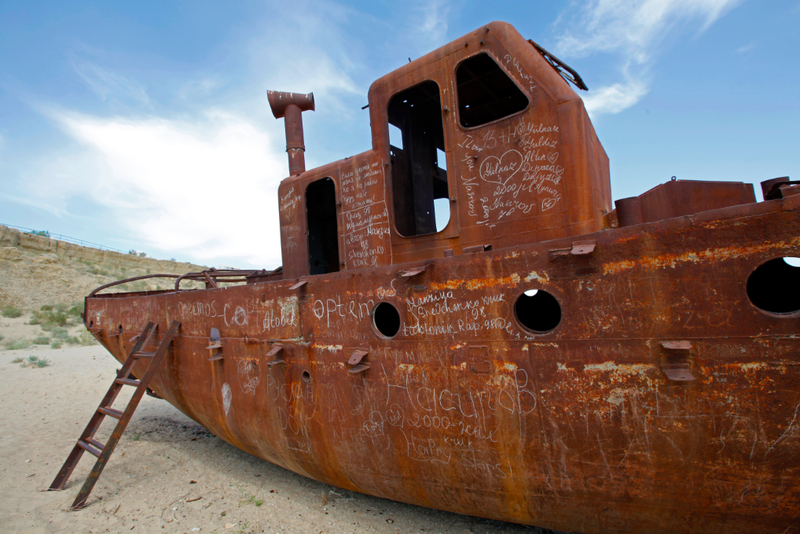 One of the most amazing things about the Aral Sea disaster is that it was no accident. The Soviet planners who fatally tapped the rivers that fed the Aral Sea, in order to irrigate new cotton fields, expected the sea to dry up. They also wanted to bring water to Central Asia by a huge canal from Siberia, not to replenish the Aral Sea but to expand cotton production still further. When camping on the shore, the guide offered me to have a swim. But knowing that residues of pesticides, fertilizers and defoliants used on the cotton fields found their way into the sea… I skipped. To restore the Aral would require irrigation from the Amu-Darya and Syr-Darya to cease for three years, or at least a slashing of the irrigated area from over 70,000 to 40,000 sq km; in other words, a complete restructuring of the economies of Uzbekistan and Turkmenistan. No-one is seriously considering this. In 2003 the little channel still connecting the northern and southern seas was blocked by a 12.8km-long dike, preventing further water loss from the northern sea (on the Kazakh side), but condemning the southern sea to oblivion. Apparently, Russia has been talking about feeding the Aral Sea with a Russian river but from the talks I’ve had locally, I can tell you that here, in Moynak, no-one believes it. 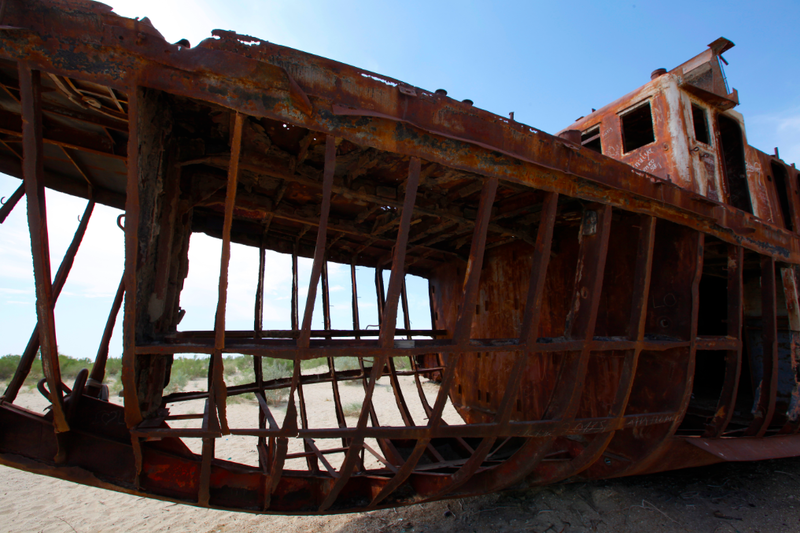 This entry was posted in Uzbekistan and tagged anthrax, aral sea, Vozrozhdenia Island by Stephanie Nedjar. Bookmark the permalink.